This product is D.I.Y., so assembly is certainly required! Typical dollhouse kits are very beginner-friendly and involve cutting and gluing, folding paper, bending wires, etc. 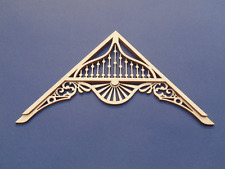 You are buying 1 Victorian dollhouse Apex Gable end trim 1-13/16" H X 3 -1/2" W in. 1:24 Scale . Gable has a 12/12 roof pitch with a nice ball & spindle pattern.The unfinished wood is sanded smooth ready to paint or stain to the color of your choice. Laser cut on Japanese crepe/cotton acid free paper. You will need paper covered 30g wire, acrylic paint and white glue. This can also be a calyx in 1/12th scale. IT IS 14" TALL. IT HAS FLAWS, NOT MY BEST WORK, REASONABLE PRICED. Dollhouse Miniature Realistic Easter Egg Coloring Kit 1:24 Scale - Handmade - New Combined shipping available, please request a new invoice before payment, thank you!! (Combined shipping excluded if you only purchase items with $1 shipping charge unless you purchase more than 3). Purchases over $25 will have an added shipping insurance fee (or priority shipping, whichever is cheaper). Manufacturer's Item Number: CC1809 EAN Calico Critters are distributed by International Playthings. By Calico Critters. Calico Critters. Dining Room Set includes a dining table and baby chair suitable for up to 5, and a delightful kitchen cabinet for storing kitchenware. This two light sconce has CK1010-12 replaceable bulbs. Includes CK801-2 sconce adapter. 1/2in to 1ft. 1:24 Scale. This is half the size of a "standard" dollhouse item. The pieces are separated into labeled bags and are letter/number coded. Easy aseemble with instructiosn. The tiny accessories showed in the picture such as the safa, desk can be painted, cutted or sticked to built with your hands. BUT A COLLECTOR ITEM. A GREAT ADDITION TO YOUR HOBBY OR COLLECTION. (NH-HA-SH-CE). Sylvanian Families Calico Critters Furniture Dining Room Set CC1809 . Condition is New. Shipped with USPS First Class Package. Calico Critters DINING ROOM SET Over 15 Pieces! Seats 5 Critters! BRAND NEW! Calico Critters 15 piece dining room set. I do own a pet so a hair may inadvertently end up on the item. I work hard to not grossly misrepresent! (C.We will send you the electronic instruction when you order it. (need to DIY) 3) Dust proof cover and LED lights.4)This item not include the music box. Part Number: dollhouse--Cat Diary. It's need your DIY model,all furnitures and accessories shown in the pictures are included. All complete. IT IS A “PLAN IT” KIT FROM 1965 Made by PIK Plan It Kits out of Tucson, AZ - for furniture/house arranging miniatures but would work for diorama, G train, dollhouse, etc. 1/2" equal 1 foot (1:24). 【Exquisite Mini House and Eco-Friendly Materials】Our diy mini doll house is very well made, using a miniature scale of about 1:24. All pieces are in seperate bags and a colourful step by step instruction book is included, which is a joy to read and very clear.The materials in the kit are eco-friendly, have no burrs.The paint is odorless and can also be easily washed out by water. CuteBee Dollhouse Miniature with Furniture, DIY Wooden DollHouse Kit. We want to encourage you it easy to assemble just a little patience. Printed sheet was included to locate the numbered parts, and English manual with detailed and colored pictures will guide you how to do step by step. The ensemble includes a light up fireplace (AAA batteries not included), accessories and more! These life-like, award-winning miniatures also inspire imagination and creativity. Calico Critter families are just like real families, and every mom, dad, sister and brother plays an important role in the Cloverleaf Corners community. With wood, fabric, thread, wire and the other accessories in this kit, it adds realism to the kitchen project. If you like your dollhouse rooms to look realistic, then this kit is for you. Play with your imagination to design your own dollhouse. Every furniture has a tiny magnet on the back and you can use them as a fridge magnet. Note - Keep the miniatures dry and cool, avoid sunlight. We’re here for you. You've never seen these before! Scale: 1:24 Miniature Dollhouse. Furniture set with accessories: kitchen cabinet, tea set, toaster oven, dining table, chair, baby chair, etc. Dining Room Set includes a dining table and baby chair suitable for up to 5, and a delightful kitchen cabinet for storing kitchenware. Unihobby DIY dollhouse Modern Loft, New In Box. Condition is New. Shipped with USPS Priority Mail. Dining Room Set includes a dining table and baby chair suitable for up to 5, and a delightful kitchen cabinet for storing kitchenware. Kitchen Cabinet, Drawer x2, Toaster Oven, Toaster Oven Tray, Cookie x2, Plate, Pot, Lid, Cup x2, Saucer x2, Glass x2, Dining Table, Chair x4, Baby Chair (a total of 22 pieces). Cabinet with hutch. Over 15 pieces! No fine print here! We are just honest, hard-working folks trying to make a living. Sealed in original box. Dessert Plate.